The Gryphon has the body of a lion and the head and wings of an eagle. As the lion is the king of the beasts and the eagle is the king of the air the Gryphon is an especially powerful and majestic creature. Gryphons are more fierce than dragons, more majestic than unicorns and revered by more countries and civilizations as a superior beast to be honored. As passionate as they are in protection for their Keeper and self they are equally as passionate in giving love to their Keeper. They are one of the most powerful, magical and mystical creatures to ever exist. They are the guardians of hidden treasure, gold mines, precious stones and nests its fortunes. When you become a Keeper of one of them they will lead you to fortunes of your own. They help you gain monetary rewards as well as amass other valuables. They are a powerful and extremely magical creature that loves to be near wealth. The Gryphon is highly in tune with the spiritual and astral realms using their portals to their advantage. They scour at all times any avenue to take which will lead to rewards and blessings. Gryphons were consecrated to the Sun; and ancient painters represented the chariot of the Sun as drawn by Gryphons. 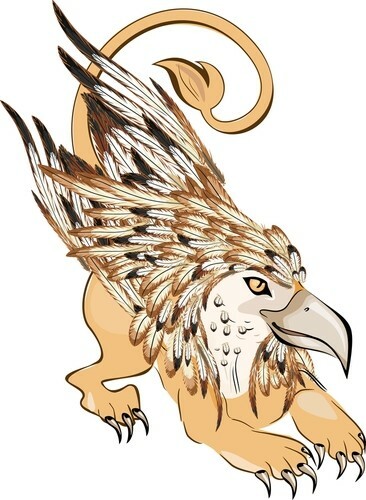 The Gryphon inhabits the Scythia steppes that reaches from modern Ukraine to central Asia; gold and precious stones are abundant; and when strangers approach to gather the stones, the creatures leap on them and tear them to pieces... and they protect your wealth and fortune the same way. They gather the riches and protect them for you with extreme fervor. Gryphons are special, truly unique creatures that enjoy having a human Keeper as they have always held humans with affection... this connection to humans is thought to be why they are favored to be used in heraldry. They are highly divine creatures that are extremely loyal... they mate for life and when their partner dies they never look for another mate. They feel an eternal and personal bond with their Keepers as well. When someone invites them into their home they make a deep and meaningful connection to their Keeper and serve them vigorously. They have been adored, admired and loved by civilizations for centuries over many, many countries including Egypt, England, France, Germany and many more. This Gryphon spirit’s name is Geddea. She is 1,484 years, with a light-grey hide and silver mane. She is social, funny, bright, inspiring, happy, and empowering. She is a lively and gracious friend who works well with other spirits on joint tasks. She is a visionary who will give you advice and support when it comes to hope, joy, and passion. She is a giving, loving, and compassionate friend who surrounds you with enlightenment and mystical grace. She communicates well through visions and telepathy.